Touchstone took its “community-based theatre skills” into a new community when The City of Tamaqua hired us to help them create a performance that would propel their city in a positive direction. Beginning in early 2014, Touchstone guided the Tamaqua team (artists, city officials, business leaders, etc.) through story-gathering in the form of one-on-one interviews and “Dear Tamaqua” letters written to the town about memories past, current loves and frustrations, and hopes for the future. 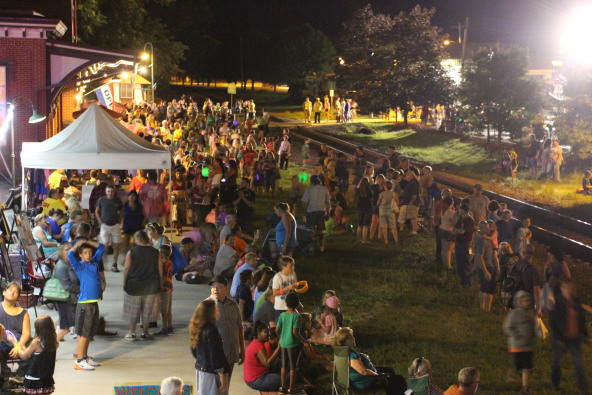 These 500+ submissions, from a town of roughly 7,000, were then incorporated into a production concept designed and directed by Touchstone and performed by the Tamaqua residents on August 4, 2015 throughout the town streets. Event attendance was over 1,400 and the positive effect, even months later, was palpable. The Tamaqua team has continued to evaluate success and note changed community perceptions. An attitudinal study comparing results from 2011 and 2016 (six months after the project was completed) showed marked increase in residents’ positive feelings towards their town, their neighbors, and their impact on making their town a better place.